We adjusted this recipe and bought whatever fruit was in season. We added fresh: grapes, mangoes, peaches, plums, pineapple, etc. Any fruit will work! We didn’t measure anything out. We just bought about the same amount of everything, cleaned it, cut it and mixed it in a bowl then poured the bowl into the watermelon. Easy. However, I was going to skip the water/sugar/lemon zest sauce, but it is the secret to making this recipe divine and keeping the fruit from turning brown. We made this recipe twice in July and it hit the spot both times. We munched on fresh fruit for days. In fact, I think I’d like to throw it together again soon. With a large, sharp knife, remove the top 1/4 section of the watermelon. With a melon baller (cookie scooper or small ice cream scoop work well too), scoop flesh from inside of watermelon, removing as many seeds as possible. Leave 1/2 inch of flesh inside the shell of the watermelon. Scoop cantaloupe and honeydew in the same manner, removing as much flesh as possible, and discarding the rinds. Refrigerate fruits separately until ready to assemble. Don’t skip this: In a small saucepan over medium-high heat, bring water and sugar to a boil. Remove from heat, and continue stirring until sugar has completely dissolved. Add lemon zest, and set aside to cool. To serve, place watermelon balls, cantaloupe, honeydew, oranges, pineapple, strawberries, and grapes, in a large mixing bowl. Pour syrup over, and toss thoroughly. 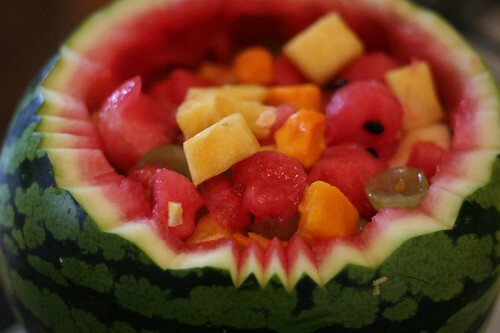 Transfer mixture to watermelon bowl, and serve. Set aside any fruit mixture that will not fit. There will be enough fruit to refill the bowl.